With Argentina as the featured nation at ARCOmadrid 2017, Madrid will offer a unique perspective on Latin American contemporary art, both at the fair itself—which this year will continue to emphasize high-calibre booths that limit their presentations to single or pairs of artists—as well as in a series of exhibitions of Argentinian artists and Latin American contemporary art collections hosted by museums and art centers throughout the Spanish capital. Standing at the cross-roads between Europe and Latin America, ARCOmadrid—now celebrating its 36th edition—has established itself over the years as one of the premier international platforms for Latin American art and its market, a role that will be reinforced this year with the carefully selected presence of Argentina. In addition to the General Programme—which this year has undergone an especially rigorous selection process—ARCOmadrid will offer #ArgentinaPlataformaARCO, a special gallery section curated by Inés Katzenstein and consisting of 12 Argentinian galleries presenting artists individually or in pairs. In conjunction with the #ArgentinaPlataformaARCO, a series of exhibitions will be held at art and cultural institutions throughout Madrid, spotlighting contemporary Argentinian artists and with shows of some of Latin America’s most important contemporary art collections. Curated by Sonia Becce, the program will include exhibitions of Argentinian artists such as Guillermo Kuitca, Jorge Macchi or Leandro Erlich, as well as of collections such as the Argentinian Costantini Collection and other Latin American collections such as the Peruvian Hochschild Collection and the Mexican Coppel Collection. As in other editions of the fair, ARCOmadrid 2017 will also feature additional curated sections, offering collectors and fair visitors a singular opportunity for an in-depth look at some of the most up-to-date art being created today. Dialogues, jointly curated by María de Corral, Lorena Martínez de Corral, and Catalina Lozano, will consist of a selection of galleries, each with only one or two artists, and presenting new work created especially for the fair. The Opening section of the fair, curated by Juan Canela and Stefanie Hessler, will consist of a selection of 17 new galleries, all of which have opened within the last seven years. 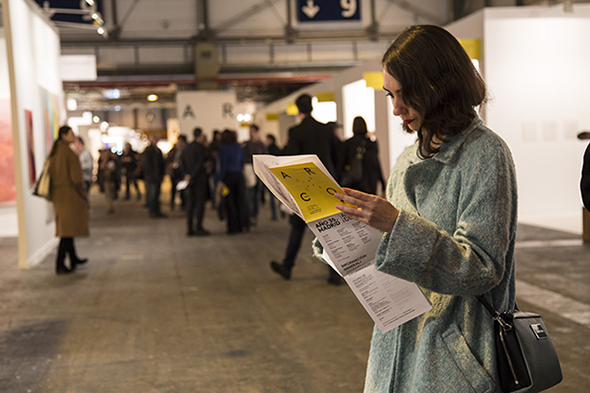 As has become a hallmark of ARCOmadrid, this year’s edition of the fair will include an extensive program of professional activities, inviting critics, curators, museum directors and major art world figures to participate in a wide-ranging program of panel discussions and professional meetings. These acclaimed events offer a broad spectrum of art world figures an opportunity to discuss projects and debate ideas, while at the same their visions and voices are incorporated into the fair’s overall activities. Highlights of this year’s professional program will include panel discussions moderated by the fair’s guest curators in conjunction with Chris Sharp; discussions and research sessions on contemporary collecting directed by Estrella de Diego and Judith Benhamou-Huet; and meetings of major international museum directors organized by João Fernandes. In addition, ARCOmadrid will invite numerous art world professionals and collectors from around the world to attend the fair.